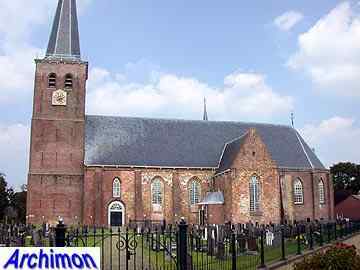 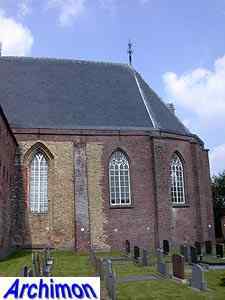 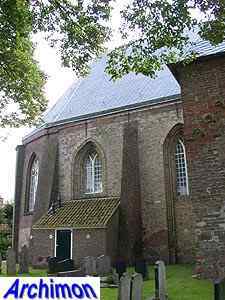 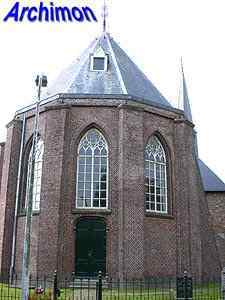 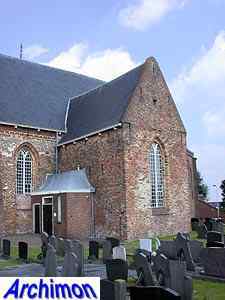 Although built at the typically Frisian location of a terp, this church no longer looks like a typical Frisian church ever since the saddle-roof tower, which collapsed in 1804, was replaced by a new one with a spire in 1806. 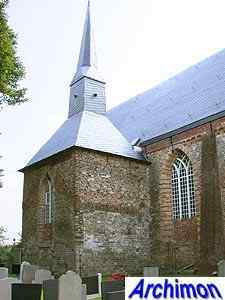 The church dates from ca. 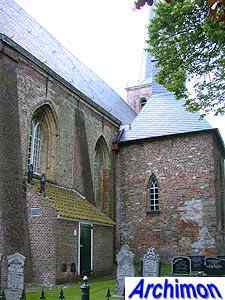 1300, and was probably dedicated to St. Martinus. 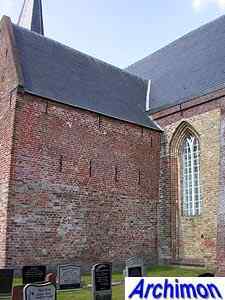 A part of an earlier church remains in the form of a space at the northern side of the nave. 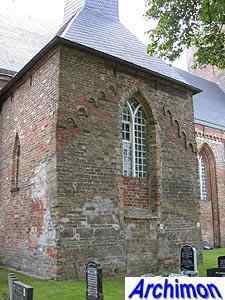 This transept-like construction has some nice Romanesque masonry, as well as a peculiar tower on top. 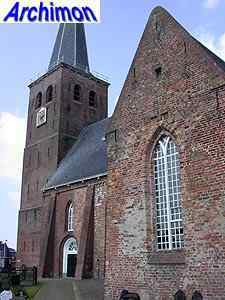 This earlier church, according to an old story, was set on fire by one of the rivalring parties during a feud. 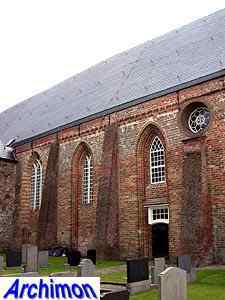 The nave was built using the tuff stones of the first church, as well as brick. 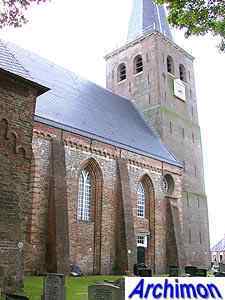 Details indicate that it was built in a time when Romanesque was gradually replaced by Gothicism. 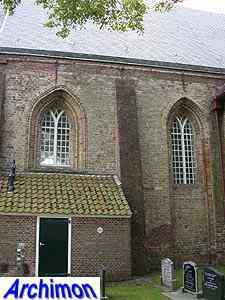 This is especially true for the bead-profiles around the windows, a typical feature of Romanogothicism. 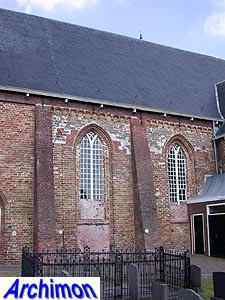 The buttresses are not for the support of the building, as the church has wooden vaults, but were added after the Reformation to hide some decorative brickwork from catholic times. 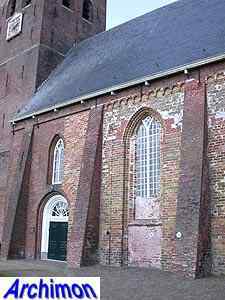 The southern 'transept-arm' is called 'Koarte Gaerde', a corruption of the French Corps du Garde, a reminder of 1795, when it housed French soldiers. 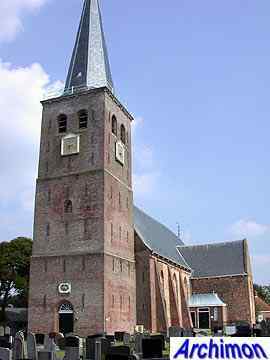 The tower in that time was used for Napoleon's optical telegraph network.